The sheer volume of top-notch Android games can be daunting – but not if you let Samsung Game Hub take the strain. The stunning success of the mobile web, facilitated by the sophistication of Android and the exponential rise in the power of handsets (with the likes of the GALAXY Note II providing shining examples) has led to a well-documented (and very first-world) problem. With all that information and entertainment at your fingertips, even when you're on the move, where do you go to find the precise things that float your boat? Let's say, for example – and we've all experienced this – you're sitting in a cafe, waiting for a friend to appear, and fancy filling your time with a bit of cheeky gaming. There are, of course, thousands of Android games you could choose between, so where should you start? Luckily, that is an easy question to answer. All you need do is click on your GALAXY Note II's Apps icon, and seek out the one entitled Game Hub. 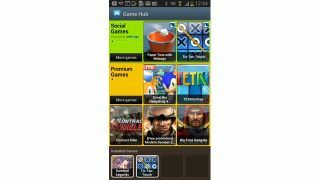 Indeed, you can go one better than that – the Game Hub exists as a Widget, which you can press on until highlighted, then pull across to occupy an area of real-estate on one of your GALAXY Note II's less-occupied screens. But however you access it, the Game Hub has one purpose: to bring you instant access to the best Android games in existence. If you like, it's a sort of filter, through which Samsung (invisibly) is constantly working to select the very games, which, with all its experience as the world's top handset manufacturer, it reckons you will want to play. If you're worried that the sheer amount of Android games out there means that there must be plenty of dross among the gems, you can rest assured that none of that dross will make it through the stringent selection process that governs the Game Hub. Once you've registered for a Samsung account (which involves inputting a basic level of data like your name, date of birth and email address – and if you just fancy playing free games, you don't have to surrender your credit-card details), the Game Hub presents a gloriously straightforward and self-explanatory face to the world. It presents you with a matrix of games, selected according to their popularity. And they are essentially split into two categories: Social and Premium. The Social games are, perhaps, the most interesting, as they aren't just about sitting around in isolation and entertaining yourself. Instead, they take the proposition that has made gaming such a compelling activity on social networks like Facebook, and launch that into the mobile space. In other words, they are all about gaming with your friends, no matter your whereabouts. In order to access the Game Hub's Social games, you must sign up for another service, called mobage – which is free, and the sign-up process merely consists of generating a username and a password. When you've done that, you can get on with downloading some games, and can communicate with, and play against, your friends. Launch a game, and you will see the mobage icon in the top right-hand corner; click on that and you get a social networking-style screen that details your games and your friends. Thus, you can see what they have been playing, and invite them to compete. Once you've made that initial leap to playing a game against human rather than computer-controlled opposition, we reckon you'll develop a lasting taste for it. You'll also begin to appreciate how cleverly Game Hub caters for all tastes. It does, of course, contain some pretty basic, board-game-influenced efforts, like Tic-Tac-Touch (mobage, free), which are perfect for dipping into when you have a tiny bit of time to kill. But there are plenty of surprisingly sophisticated games on offer, like the anime-style, utterly addictive trading card game Darklord Legends (mobage, free).